The Wright Brothers worked closely together doing pioneering work with gliders as a prelude to their powered flight experiments. Based on these efforts and associated ground experiments, they became the first to achieve controlled powered flight. They were inducted into the Soaring Hall of Fame as individuals; however, since their work is so interconnected, they are described here in one short biography. They are most famous for their successes with powered flight but our emphasis here is on their unpowered achievements. We refer you to the many references documenting their powered flight efforts. The Brothers began their investigations with gliders before moving on to airplanes. They applied scientific analysis actually building a wind tunnel in their bicycle shop in Dayton. Of most importance and distinguishing them from other investigators, they solved the problem of stability and control and demonstrated it with their glider and then with their successful powered airplane at Kitty Hawk on December 17, 1903. Wilbur was born on April 16, 1867, in Millville, Indiana and Orville on August 19, 1871 in Dayton, Ohio. They were inseparable until Wilbur died in 1912. Their personalities complemented each other - Wilbur tended towards mature judgments and completing projects he started; Orville let his enthusiasm run wild generating ideas. 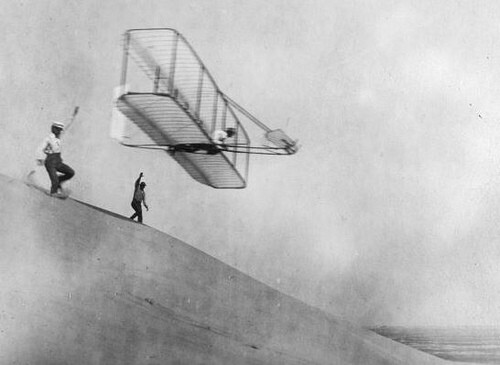 The Brothers flew their first glider at Kitty Hawk in 1900. It was more like a kite and did not do well. However, they learned from their failures as well as successes. They did some wind tunnel tests - more than 200 wing shapes -- and returned to Kitty Hawk again in 1901. Hawk. They made over 1,000 flights in 1902 demonstrating how they controlled the glider - not by body weight shifting but by stability and control provided by aircraft control surfaces. They were ready at last for powered flight and, as is well known, were successful in 1903. As Orville expressed approximately to Vic Saudek and Paul Schweizer in later years: "You know and we knew then that it was more fun to fly gliders than to fly powered airplanes."